Las Vegas High’s flag football team scored 20 unanswered points in the second half to rally for a 27-20 win at Foothill on Thursday. Las Vegas High’s flag football team scored 20 unanswered points in the second half, and secured a flag pull on the 3-yard as time expired to rally for a 27-20 win at Foothill on Thursday. Kaitlyn Horstdaniel threw for 295 yards and two touchdowns for the Wildcats, and Angelina Visitacion hauled in 115 receiving yards. Foothill’s Whitley Brow had 11 catches for 205 yards, and added an interception on defense. Ronni Gibbs and Chloe Collins each had a rushing touchdown, and Julia Lynch caught a TD for the Falcons, who led 20-7 at halftime. Collins (11 tackles, one sack) and Niyah King (10 tackles) led Foothill’s defense. Coronado 28, Shadow Ridge 6 — At Coronado, Caitlin Shannon completed 10 of 15 passes for 148 yards and three touchdowns, and the Cougars stormed to a 21-0 halftime lead before downing the Mustangs. Jensen Boman had four catches for 80 yards and a touchdown, and Reagan Raimer supplied five catches for 60 yards and a score for Coronado. Freshmen Rachel Burt provided a pick-6 for the Cougars on defense. Abbie Zuhlke had a 6-yard touchdown catch for Shadow Ridge’s lone score. Canyon Springs 24, Western 12 — At Western, the Pioneers grabbed a 12-6 halftime lead in their win over the Warriors. Western’s Shydae Elam ran for 120 yards on 13 carries, and teammates Koloa Makaafi and Yareth Medina each had a rushing touchdown. Cesia Navas had eight tackles to lead Western’s defense. Virgin Valley 54, Sunrise Mountain 12 — At Mesquite, Katie Zuniga had 12 carries for 106 yards and three touchdowns, and the Bulldogs racked up 508 yards of total offense in their win over the Miners. Emily Teerlink had seven carries for 63 yards and two touchdowns, and Kallie Graves completed 9 of 18 passes for 138 yards and a pair of scores for Virgin Valley, which led 32-6 at halftime. Madison Cheney and Alyson Cook each caught a score, and Kendyl Bower led the defense with five tackles for the Bulldogs. Tech 26, Valley 0 — At Tech, Taylor Ritayik threw two touchdowns and rushed for two scores in the Roadrunners’ shutout of the Vikings. 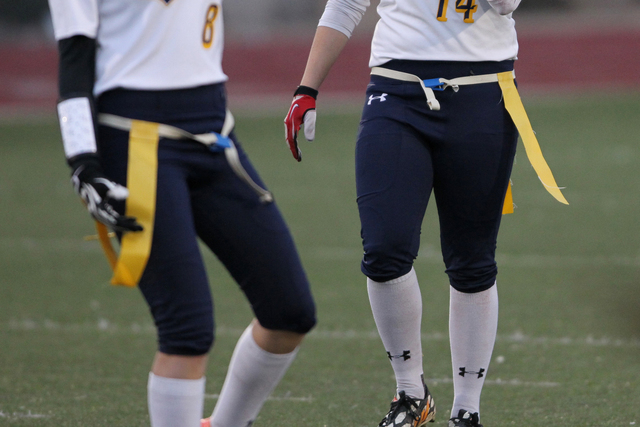 Haylee Romero had two sacks for the Roadrunners, and Maria Galindo and Erin Adarve each had an interception. Galindo and Alondra De La Garza each caught a touchdown pass for Tech. Del Sol 41, Liberty 0 — At Del Sol, Angel Hodges ran for 93 yards and two touchdowns on 10 carries to lead the Dragons to a shutout victory over the Patriots. Stephanie Tewart threw for 145 yards and two touchdowns for Del Sol. Tarika Poullard had three sacks, and Arianna Reifer had two interceptions to lead the Dragons on defense. Arbor View 27, Desert Pines 7 — At Arbor View, Brittnee Kublick tossed a pair of touchdowns and ran for a score to power the Aggies by the Jaguars. Grace Ruszczyk and Bella Jorgensen each caught a touchdown for Arbor View, which scored 20 unanswered points in the second half. Cheyenne 26, Chaparral 13 — At Cheyenne, the Desert Shields rallied from a 7-6 halftime deficit to beat the Cowboys.